Greta Stoddart, who lives at Oxenlears in Kilmington with her partner Stewart and their two sons Jesse and Frank, has won critical acclaim for her collections of poems: At Home in the Dark (Anvil) for which she was awarded the Geoffrey Faber Memorial Prize in 2002, and her second collection Salvation Jane (Anvil) which was short listed for the Costa Book Award 2008. Her third book Alive Alive O was recently published in June 2015.
on to gain a degree in Drama at Manchester University before moving to Paris where she lived for two years studying at the Jacques Lecoq International Theatre School. It was here she met two other women and formed BROUHAHA, a silent clown theatre company which toured Europe and the UK for five years with their award-winning performances. Returning to live in London Greta realised she was becoming increasingly interested in poetry, so she went on various courses and attended the Poetry School. She began getting published in magazines and newspapers such as Poetry Review, Times Literary Supplement, Spectator, Financial Times and the Independent on Sunday. 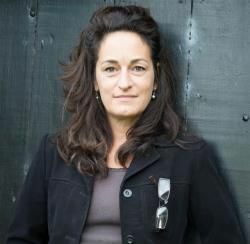 Winning two major competitions, the Exeter Poetry Prize and the Times Literary Supplement/Blackwells Competition, both in 1998, helped her on the way to getting her first collection published in 2001. Her poems have since been included in many anthologies most recently 20th Century Women Poets (Bloodaxe,2005), The Poetry of Medicine (Calouste Gulbenkian 2006), The Picador Book of Love Poems (Picador 2009) andThe Best of British Poetry 2015 (Salt). Her poems were recorded for the BBC4 radio programme The Echo Chamber in 2014. She has recently completed commissions from the Jurassic Coast Schools Teaching Alliance and the Bristol Festival of Ideas. Four years ago, Greta was appointed Writer-in-Residence at Exeter University leading a number of projects in Devon which strengthened her feeling that she wanted to leave London. She had spent many childhood holidays sailing along the South West coast in her father’s boat and had always felt peculiarly at home here. Then she found out her French ancestors had, in 1683, landed at Topsham to escape religious persecution by the Catholics – was that why it felt like a safe haven?! When Stewart and Greta spotted Oxenlears advertised on the internet, they rushed down to Kilmington and immediately decided they wanted to live in the lovely house with its spectacular views over the Axe Valley. While her 2 sons are at local schools Greta teaches for the Poetry School in Exeter and Bridport. She also runs workshops and gives readings across the UK.